By Adriana Homolova, Eva Schram and Frank Mulder - ISDS (Investor State Dispute Settlement) is a mechanism by which a foreign company can sue a government for decisions and policies that harm their investments, without actually going to court. It has been set up to protect investors against risky investments in less developed economies. However, ISDS is increasingly used by multinational companies to pressure countries into rolling back their policies or paying up astronomical sums of money. There is a lot of debate around these arbitration mechanisms but, unfortunately, information about these disputes is hard to find. To make these treaties more transparent, we have collected and connected details from all of the public cases, such as the start, duration and outcome, the demanded and possibly paid compensation, as well as a short description of the case. The information was collected semi-automatically from various sources, such as the internet archive, university researchers, NGO's, newspapers and the official website with all the documents about the cases. The materials came in various formats: tables, but also websites and scanned pdfs. We have used a bit of scripting in python to automate as much as possible. The process of collecting, cleaning and joining the information into one coherent dataset took us about two months. The dataset contained around 630 cases, which are being held or have been held in the last two decades. As each case is based on a relation between two countries (two countries sign bilateral treaties that form the basis for a case), we have chosen to visualize the information in an interactive network map. The reader can explore the details by clicking on the country of his or her interest and explore cases that were filed from the selected one against other countries. 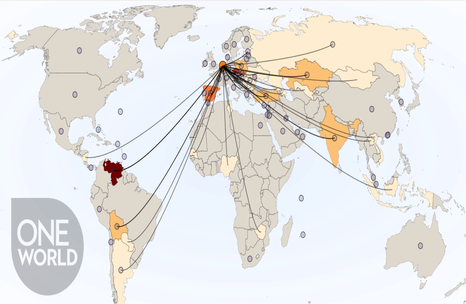 This map is a part of the OneWorld DataAtlas project. Arbitration cases are overwhelmingly applied for by companies from western economies. While this is clear from the data, the mechanism is a bit more complicated. A great example is the Netherlands. More than 10 percent of all known investor-state disputes worldwide are based on a Dutch investment treaty. However, it is estimated that in 75 percent of all cases it is actually not a Dutch company filing the case, but rather a mailbox company registered in the Netherlands. This way, virtually any company in the world can use Dutch treaties in order to sue other countries. So you can find, for example, a case filed by a partially Venezuelan company, Venezuela Holdings, suing Venezuela. The case, filed in 2007, has won the company $2 billion. The story was well received and re-published in English, Dutch, French, Spanish and German. It was also reported on extensively in more countries and media. We want to make sure that the work we have done will not just stay locked away after the article has been published. We have therefore opened up not only the source datasets and scripts we have used to connect them, but also the network map we have developed for the project. We are more than happy to answer questions about the data or the map data [at] oneworld [dot] nl or via our Twitter handle @OneworldData! Explore the project further here. Note: In 2015 Frank Mulder and his team received a grant of €18600 from the IDR Grant Programme to carry out this project. You can see the full project and all publications here. This story was originally published on http://datadrivenjournalism.net/ and republished with permission.